Developing a gripper that can grasp objects of widely varying shapes represents a challenging task. Compliant mechanisms with embedded actuators are one way to obtain the gripper which could accommodate its grasping surface to any irregular and sensitive grasping object. 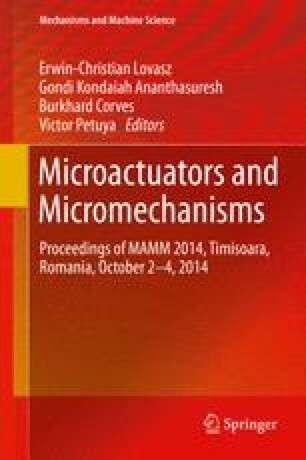 This paper presents the new solution of adaptive compliant gripper finger with embedded actuators. Embedded actuators (within gripper finger structure) are able to morph shape of the grasping surface to accommodate different objects. Novel approach to the synthesis of compliant mechanisms with embedded actuators is also presented. The main contribution of this approach is that optimization of the actuator placement is included in the design process. It will be shown that gripper finger can achieve many complex grasping patterns via embedded actuators.